With the global population expected to reach over nine billion by 2050, food production will need to increase by almost 70 per cent to meet the increasing demand. However, rising sea levels caused by climate change are likely to lead to increased erosion and inundation of salt water, reducing the amount of land available for farming, particularly on small islands and in low-lying coastal regions. Now researchers at Nottingham University have developed the concept of floating deep farms, consisting of large vertical shafts or containers, submerged under seawater near coastal areas. The containers, which could be used to grow a variety of crops, could also act as a sink for carbon dioxide captured from the local environment. The project is the brainchild of Prof Saffa Riffat, chair in sustainable energy at Nottingham’s faculty of engineering, and research fellow Prof Yijun Yuan, a specialist in mining engineering and sustainable energy. In October, 2018 the pair unveiled plans to build underground farms within the disused tunnels of depleted coal, salt and gold mines in countries such as the UK and China. They have since had interest in the idea from as far afield as the US and South Africa. To develop the idea further, the researchers have now filed a series of six patents on the use of such deep farms in land, seawater, and rivers. “For areas close to the sea, which are vulnerable to sea level rise caused by climate change, one option is to go into the water, so they can still carry on producing food,” said Riffat. The floating containers would be sealed at the bottom, and covered with a dome at the top. Crops would be grown using either hydroponics, in which plant roots are fed with nutrient-rich waters, or aeroponics, in which they are housed in a mist environment. The containers would be lit by LEDs of appropriate wavelengths to maximise photosynthesis, while consuming as little power as possible. Waste heat from the LEDs could also be combined with solar energy and used to convert seawater into fresh water by desalination. 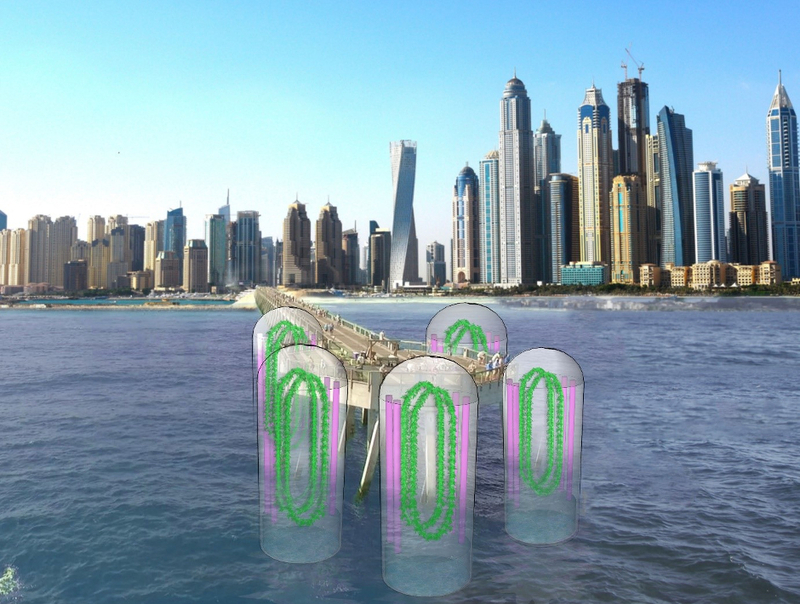 The solar energy and LEDs would heat the salt water, causing it to evaporate, and this vapour would then be condensed inside tubes to produce fresh water for the plants. Unlike conventional farming, which is restricted by annual seasonal changes, the controlled environment within the containers means crops can be grown all year round. The enclosed farms also allow plant diseases and pests to be more easily controlled. What’s more, submerging the farms in seawater provides a stable temperature all year round, unlike conventional greenhouses and vertical farms, which rely heavily on expensive and energy-intensive heating and cooling systems to regulate the environment. To provide the necessary power for the LEDs and other systems, the vertical shafts could be directly connected to offshore wind turbines, or wave or tidal power devices, to utilise locally available renewable energy. 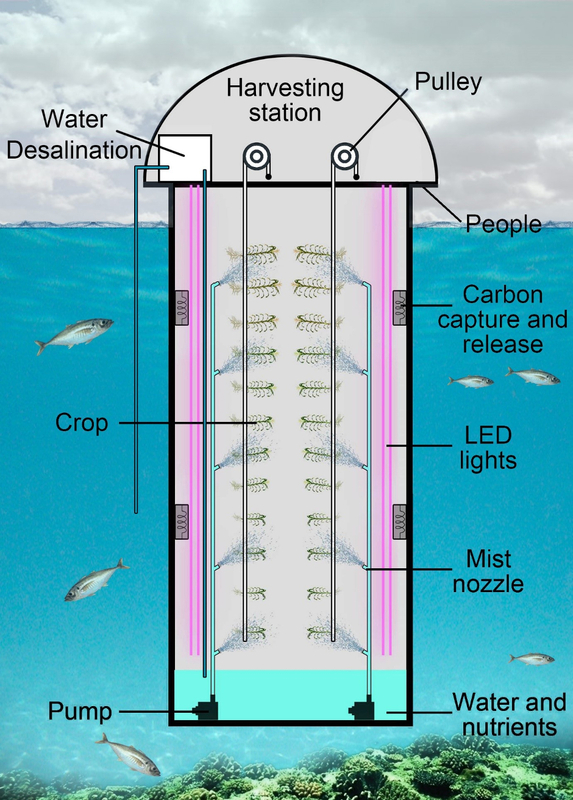 The floating farms could also incorporate aquaculture for fish and shellfish, with oxygen produced by the plants fed directly to the sea creatures. 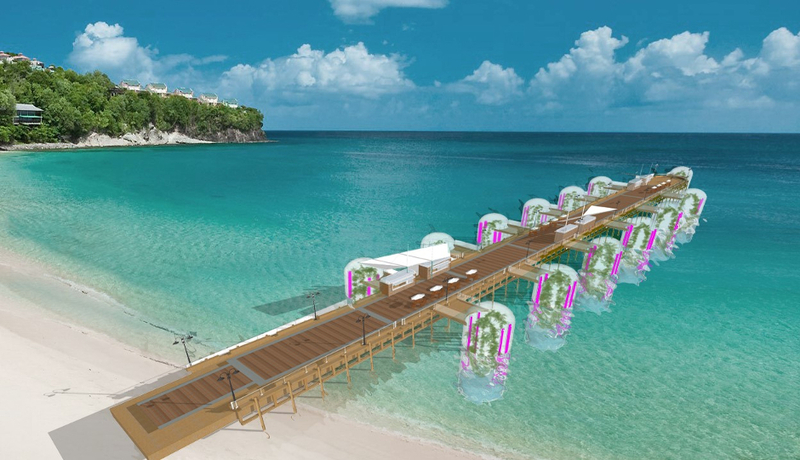 They could also provide protection for coastal communities from erosion, according to Riffat. “You could have a number of these farms around coastal areas, and they could also work as a barrier, a defence system across the coastal area,” he said. The researchers have also filed a patent on the use of deep farms in desert regions. The vertical shafts could be sunk into the sand, with solar panels used to power desalination of salty or brackish water from the underground water basin. I quite like this idea, whether it happens or not. It at least illustrates the often meaningless discussions about finite resources that drives green and sustainable thinking. Relying on LEDs (in a way that I doubt the inventors of such devices had) shows that new resources are always being developed and in this case unlocked through human ingenuity. Finite resource arguments always miss out that most important (and potentially infinite) resource – human ingenuity. Of course if the oceans were covered in such devices new problems will emerge – but new solutions and resources would very likely have been developed by then in a similar way. The issue is to re-balance all the negativity of humans as being polluters and consumers- but celebrate and invest in research – especially that may initially have no obvious use and may even be initially wasteful when looked at through the narrow view of the present and the perceptions I mention. Engineers are clearly key to this and get back to positively developing new ways to exploit (in the best possible way of course) the planet rather than often trying to appear relevant and acting as the saviors of the planet – which is generally reinforcing the negativity that is around re Engineering. I agree will Paul it is good to see these innovations that may play a key role in mitigating human excesses that are ruining the planet. However with the human race exploding and gobbling up all the planet’s resources, when are politicians going to grab the nettle and implement advances to curb this growth? With religions that promote procreation as a God given right this will be hard fought, but an essential future move for the survival of humanity in my opinion. Imagine; if we had lagoons in Swansea bay and elsewhere, we would have the calm conditions, that these farms would need – no storms, swells, nor gales. Except the wise guys in the Dept Business, etc. decided they are not cost-effective. Oh, well. My comments are coming from a totally different angle and not too far from John W’s points, but: The ecological solution (probably in every practical respect) is population control. A bit ‘Orwellian 1984’ I know, but every UK city has, or will have housing, water, power, pollution, greenhouse gas emission issues, not to mention the general pressure on, and escalating cost of land – hence increasing difficulty in buying one’s own property. Having personally moved from a high density town in the Midlands to Eastern Scotland, it’s relative peace and space is wonderful for me. The sooner the governments of the world realise this principle of ‘less is more’, the better. Great concept, and presumably the next ‘step’ is to add ‘animals’ into the mix: presumably, these could just as easily ‘eat’ the products of this novel farming route as we might? Many years ago (I often seem to write that, perhaps because I’m so old I should really have stopped thinking inventively and strategically and just sit in the corner mumbling!) I proposed that we (Engineers and Biologists) should consider the ‘edges’ of deserts, swamps and mountain ranges -places where horticulture is less possible- as places to be encouraged to blossom. If the ‘tree’ and growth line were ‘raised’ by 50 metres the i did some draft calculations and established that mankind could, with simple changes, add perhaps 3-5% of arable land to our present totals. Likewise farmers have within their own particular areas of the world, established ‘best’ distances between plants: but what if that knowledge was shared, under the auspices of some World Wide agency. Optimizing factors such as prevailing wind, slope, orientation (to sunlight) altitude, rainfall, (there are many more influences on yield known best to local farmers) I do believe that it should be possible to optimise growth potential everywhere. Love the comment about Human Ingenuity missing from equations for future prosperity. Those of us who optimize knowledge of Nature’s Laws to the benefit of all mankind, hold the keys: those who simply manipulate man’s laws less so? The Monday 14 Jan episode of Business Daily titled Making the Desert Bloom on the BBC World Service radio station interviews researchers growing plants with seawater by the coast and brackish water in the desert using salt tolerant plants called Halophytes including a researcher on an island in the Netherlands who tested 300 varieties of potatoes to find the most salt tolerant version.So Halophyte varieties of different vegetables which don`t even taste salty can be grown in the seas and deserts without expensive desalination and fewer renewables. In a talk some months ago, https://en.wikipedia.org/wiki/Will_Allen_(urban_farmer) counselled a questioner to start small in doing intensive farming like this. He has good practical advice that should be listened to in grandiose systems like this. Interesting. But given the size of the windmills (circa 150 metres) being put in the North Sea (much less than 40 metres deep and a lot less than 20 metres) might it be worth having them as non-floating structures; indeed they could even be supporting structures for said windmills. If enough of these farms were co-located with the structures then one could even (like the Chinese or the Dutch) make islands out of the sandbars – and, as was suggested having grazing animals. as was suggested having grazing animals. Others might recall my tram-driving exploits. The tram line ran alongside the River Axe (Axmouth, Axminster..etc) and was originally he Southern Railway line to Seaton. Our Victorian ancestors had dug out sizeable sections of the river bank, to create the higher banking on which the railway line ran. Leaving several large areas of ‘field’ not attached to the rest. Local cows, grazing in these had noticed that the best grass grew on the ‘island’ sections. When there were spring or neap tides the Axe falls to almost a trickle: and the cows would cross over as a herd to take advantage of this. They must also have had a good understanding of tides, because I never saw them stranded. My tram passengers loved to be told this!